Shoppers will be hard pressed to find a better bargain than UsenetServer's unlimited data plans. UsenetServer is one of the most popular Usenet providers around thanks in no small part to its low price and unlimited downloads. It doesn’t come with a Newsreader app like some competitors, but for those who feel comfortable handling NZB files and want a no-frills provider, Usenet should be at the top of your shortlist. Our UsenetServer review will delve in to how it rates against the competition for retention, security, features, support and pricing. We’ll also take a look at how easy it is to use and take the UsnetServer VPN for a spin. UsenetServer’s signup page will present users with three plans, the main difference being how long they last. One-off users can opt for just three days of access for $3, though this plan doesn’t support encrypted transfers over SSL. A full month will run you $14.95, which includes SSL, while three months costs $39.95. All of these plans come with unlimited transfers and 10 connections. Signing up for the latter two also qualifies you for a 14-day free trial, which caps transfers at 10GB. These plans are priced fairly competitively and we definitely recommend taking advantage of the free trial, but not listed on UsenetServer’s sign up page are even better promotional deals. On the partners page you’ll find two more plans: monthly and yearly. The monthly plan costs just $10 per month compared to the normal $14.95, and the only difference is the lack of a free trial. The yearly plan is billed all at once but knocks down the price to $7.95 per month. That would be considered cheap even with a data cap, so the fact that it’s unlimited makes it a great bargain. These promotions could hypothetically end at any time, but they seem to stay their indefinitely. We recommend signing up for a free trial on the more expensive plan, cancelling prior to the trial expiration date, then going with the yearly offer. The yearly subscription comes with a free VPN, which otherwise costs $4.99 per month on all the other plans. UsenetServer accepts credit card and PayPal, but not bitcoin or other third-party payment gateways. UsenetServer retains files for 2,859 days as of time of writing, with over 100,000 discussion groups. All plans come with 10 server connections by default, which isn’t much but should be enough for most people’s bandwidth. We surmise that the limited number of connections aims to counterbalance the unlimited data transfers, which power users on fast 100Mbps connections could otherwise exploit. Customers can tack on 10 more connections for $3 per month. With the exception of the three-day plan, all subscribers can use the SSL-enabled servers. Transfers use 256-bit encryption so your ISP and other snoops can’t monitor what you download. We recommend a VPN to all Usenet users to prevent ISPs from throttling bandwidth, be it UsenetServer’s VPN or another company’s. UsenetServer keeps no download logs. Some personal info is stored for accounting purposes. The company operates a tier-1 server network in both the US and EU and connects to over 800 broadband access providers around the world, so finding a fast and reliable server is rarely an issue. UNS Holdings, UsenetServer’s parent company, is incorporated in the United States. That means it must comply with valid DMCA takedown requests. Some files might be missing due to this regulation. Despite that, we found that completion rate was above average. We were able to download binaries that were broken or unavailable on other providers. Speeds were excellent as well, taking full advantage of all the bandwidth we could offer it. Customers will have to invest in their own newsreader to manage NZB files and downloads, as it doesn’t make its own such app. We recommend SABnzbd, a free option that runs in your browser and is easy to set up. 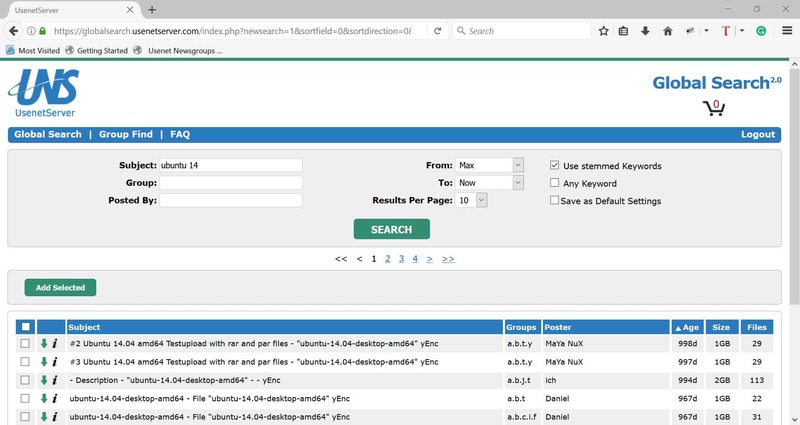 UsenetServer operates its own private indexer, called Global Search, which customers can use to search and create NZB files right from the members portal on UsenetServer’s website. You can download an NZB file right from the page, which can be used by your newsreader app to download the file itself. There’s no need to subscribe to any newsgroups, and you can even bundle several NZB files together. The search engine works fairly well for anything posted in the last couple of years. You can sort results by age and specify a group, but there’s not much for filters. Search results can’t be ordered by the number of grabs–how many times a file has been downloaded by others–which is often a good indication of a file’s quality. Global Search also doesn’t show any previews or screenshots from video files. A year-long subscription to UsenetServer comes with a free VPN for $7.95 per month, or you can opt to buy it separately for $4.99 per month on all the other plans. If you want the VPN without a UNS subscription, it will cost $11.99 for a single month or $30 for three months. UsenetServer makes its own bespoke VPN client software for Windows, Mac OSX, iOS, and Android. It can also be set up manually on Ubuntu, Chrome OS, or a wifi router. The app uses the OpenVPN protocol to connect to 70 servers in 17 different countries, including 10 different cities in the US. Users may connect up to two simultaneous devices at a time. As with UsenetServer’s Usenet plans, bandwidth and data transfers are unlimited. UsenetServer uses a standard ticket submission system to address questions and concerns. A ticket we submitted on a Monday afternoon received a response in less than half an hour. There is no phone number or live chat system, but that’s not atypical for Usenet providers. The website contains a search-able knowledge base that will answer most questions. In fact, the support section is almost identical to that of EasyNews, so perhaps there’s some common element between the two providers. We didn’t receive any unsolicited emails or other promotions from UsenetServer during or after our testing period. We were impressed with UsenetServer’s high completion rates, low price, responsive customer service, and unlimited data tranfers. The Global Search function is good for finding and creating NZB files, though it’s fairly basic. Remember to go go with the cheaper promotional plans that we linked to above. The limited number of server connections might be off-putting to those with fast internet connections, but it should be sufficient for most. UsenetServer doesn’t make its own newsreader app, so novices might struggle with the setup when compared to bundled apps from rivals like Newshosting, Giganews, and EasyNews.